Just a few miles from the sea and the small port town of Gallipoli lies this villa, nestled in the beautiful countryside of Salento. The beautiful surroundings with a variety of colors and scents is ideal to enjoy a fantastic holiday. 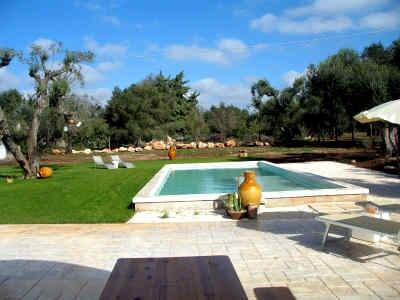 The land (11,000 m²) belonging to the house, is covered with many Mediterranean plants and a pine forest, offers benches, swings and hammocks, offers many places and corners for relaxing hours. The swimming pool (8m diameter, 1.4 m depth) provides on a hot days a refreshing bath. The house was of the very friendly owners, very lovely, cozy and comfortable furnished. Here you will find everything you need for a memorable holiday. On warm summer evenings you can enjoy the on the covered terrace a common meal. If once you want to leave this oasis, so it is only a few kilometers to Gallipoli or the sea, but also Lecce “the Florence of the South” and Otranto, to name just a few of the interesting places of Puglia, are quickly reached. Prices are for 6 persons and includes water, gas for cooking, bedlinen, towels, final cleaning. For each additional person € 100.00/week. Payable on site: air conditioning € 50.00/week, heating according to consumption, security deposit € 500.00.